Change is a frightening thing. This is a central theme in Bertolt Brecht's 1937 dramatic work "Galileo," presented by the Classic Stage Company, using a 1947 translation by Charles Laughton. Unfortunately the ultimate result is rather pedestrian. In 17th century Italy, inventor-mathematician-astronomer-physicist Galileo Galilei (F. Murray Abraham) announces that the Sun does not revolve around the Earth, as is commonly thought, but rather the Earth, as well as the other known planets, actually revolve around the Sun. This idea contradicts nearly 2,000 years of teachings by the church, and the findings of Aristotle. This proclamation is something the church hierarchy cannot allow. For to do so would, they believe, reduce man to an insignificant afterthought in the universe rather than being at its center. In their efforts to silence Galileo, they threaten to prosecute him for heresy if he persists in his statements, even as people in other quarters urge him to expound on his ideas. While Galileo at first seems to succumb to the church's entreaties, his passion and belief in the importance of the truth cannot be denied, especially after mounting evidence appears to confirm his hypothesis. There is a pivotal scene where he instructs those working with him to vigorously attempt to disprove his theory, and that only if and when it becomes impossible to do so will they proclaim their findings. All this sets Galileo on an eventual collision course with those desperate to maintain the status quo. 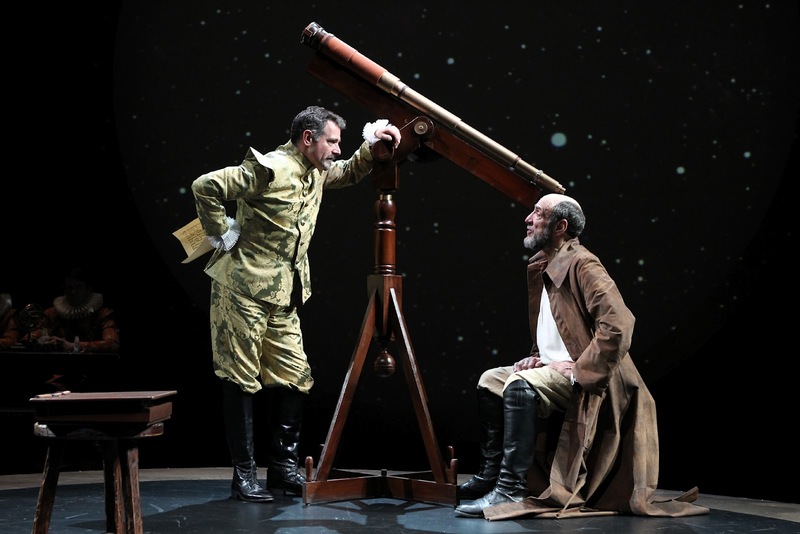 "Galileo" looks at a pivotal time in scientific history and discovery. Yet the work offers no new information on a subject most people attending will have a least a passing familiarity, with what's presented on stage feeling like an education special aimed at those in grade school. 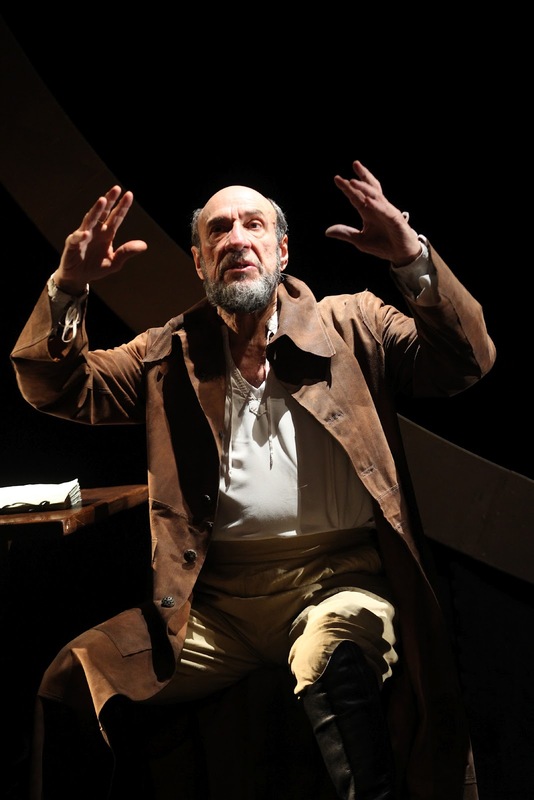 Additionally, most of the information offered is often spoon-fed to the audience, such as when Andrea (Andy Phelan), a follower of Galileo, tries to disprove the idea of an old woman being a witch. The show does contain some interesting flourishes. This includes pointing out that Galileo, for all his brilliance, was just a man, one with normal needs and desires; especially the need for money in order to live and eat. This fact is brought home via an enjoyable sequence regarding his so-called invention of the telescope, an object which plays a pivotal role in his life and in the play. Another important moment occurs when various people in authority refuse to consider Galileo's ideas, going so far as to ignore his pleas to even peer through his telescope and have the opportunity to see what he sees. Yet such high points are severely weakened due to most of the characters being more one-dimensional than anything approaching flesh and blood. The issues brought up in the show are quite serious (i.e. the church believing people will lose their reason for living if Galileo's ideas become widely accepted, and conversely how people will stop believing in the power of the church), but since those on both sides of the argument often seem little more than stock figures, it's hard to identify with any passion they try to convey. Whether the fault comes from Brecht's original text or Laughton's translation is unclear, but in either case, the work is lacking a substantial grounding in substance - somewhat surprising considering the subject matter. Things also might have turned out better were most of the supporting cast not playing multiple roles, thus allowing some of the characters a chance to have a clearer identity. Abraham's performance is a welcome exception to the characterization problem, the actor presenting Galileo as a low-key sort of fellow, one with quiet humor and gravitas. This certainly helps to make the character more interesting, and allows the audience to emphasize with his struggles on whether or not to follow his conscience, even if one knows his decision long before it is finally made. Abraham also has some nice contemplative moments studying the sky while quietly expressing wonder in what he sees. Also offering a strong performance is Amanda Quaid as Galileo's loving and pious daughter, a woman whose own future happiness may be sacrificed on the alter of her father's ideals. Brian Kulick's direction is nicely done, as is the choreography by Tony Speciale, many of the characters moving in a circular manner about the stage, either by walking or dancing, their movements indicating the paths of the planets. Complimenting this is Adrianne Lobel's simply masterful set, which depicts the heavens and the role they play in the story. Costumes by Oana Botez-Ban fit nicely into the period in which this story takes place. The story of Galileo and the trials he faced make for a fascinating subject. Unfortunately the offering by Classic Stage Company never makes said tale engaging enough to really come alive. The technical efforts are excellent throughout, but the play itself is lacking that needed spark to make it all come together.